A radiant production of Light, Fire and the elusive Atlantean energy source. The Illuminaire takes audiences into spectacular visual realms as the ancient island-city emerges to fulfil its destiny toward the enlightened future of humanity. Atlantis is awakened a second time – this time to help keep its secret alive, to make sure that the source is found, and to ensure the sacred energy will guide humankind on a more gracious and noble path. 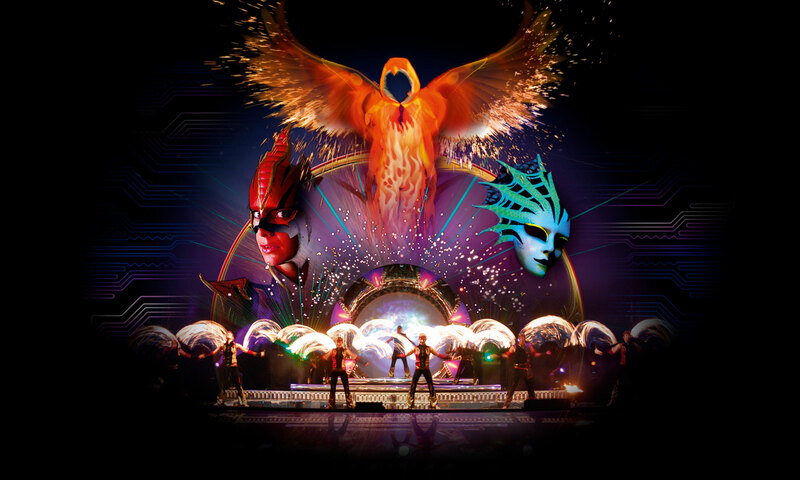 This breathtaking production – a blended fusion of Dance, Circus and Concert – also incorporates one of the greatest fire shows on Earth, as well as multiple cutting-edge technical and special effects. The mystical power source of Atlantis reverberates through every dancer and acrobat, generating a symphony of superhuman accomplishment and all-immersive audio-visual magic. The Illuminaire is the first of its kind – truly a production for the 21st century. Watch as this legendary island becomes a captivating voyage into astonishing, multi-faceted worlds and soundscapes – we invite our guests to embark into a time, place and dimension of fantastic multi-sensual joy. ‘The Illuminaire’ is universal show that audiences of all ages will appreciate for its beautiful visual fantasy, musical texture and emotional depth.